The indigenous bluebirds love it here, too. They raise their babies, avoid our cats and attack our red Honda CRV (but only in the spring) with ferocious fervor. We’re not quite sure why they don’t like the Honda, but to keep peace in our animal kingdom, we decided to avoid the issue by parking the Honda under the carport. We figured that would make them happy. It didn’t. Even though the car is out of sight the birds discovered it. Soon they were attacking it again under the carport! It’s funny to watch … but not funny to clean up the poop, so my husband decided to cover the car with a tarp. Oh the confusion! The birds flew around and around our Honda! It was hilarious. We won! YAY! HA! I was sleeping peacefully one morning, and just as the sun was peeking over the mountain top I heard this tap-tap-tap on the window. The wind, I figured, and turned over to grab a few more z’s. Then it happened again and again. I dragged myself out of bed to investigate. Nothing there. Strange, I said to myself. I know I heard the tap-tap-tap. After a nice, strong cup of Eight-O-clock coffee I settled down to work on Book 2 of the Lucy’s Angel Series (Predators) when the tapping started again. This time it was on the living room window. Quietly, oh so quietly, I arose from my chair and sneaked over to the window to peek out from behind the curtain. It was a bluebird. He (my husband says its a ‘she’) would flutter in front of the window and tap-tap-tap with its beak, fly away for a second and come back for a few more taps. 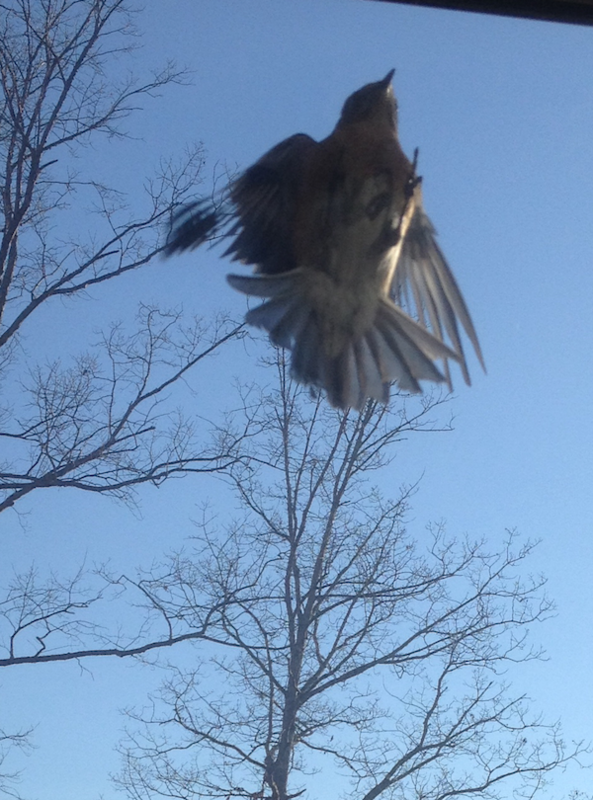 I grabbed my iPhone, determined to get a picture of the tapping bird to show my husband. It took forever, but I finally got a picture! YAY!